This is a savory version of my granola recipe. I wanted to create something with no oats that I could sprinkle on a salad, add to hummus, put on a savory smoothie bowl, add to the new trend of savory yogurts, sprinkle over a salmon carpaccio .. infinite options. It is a great snack, and way better than a trail mix. With teff grains you have an added protein and fiber source. Mix all ingredients together in a medium size mixing bowl. Line a baking tray (I use a perforated baking tray it bakes everything faster) with parchment paper or use a Silpat. 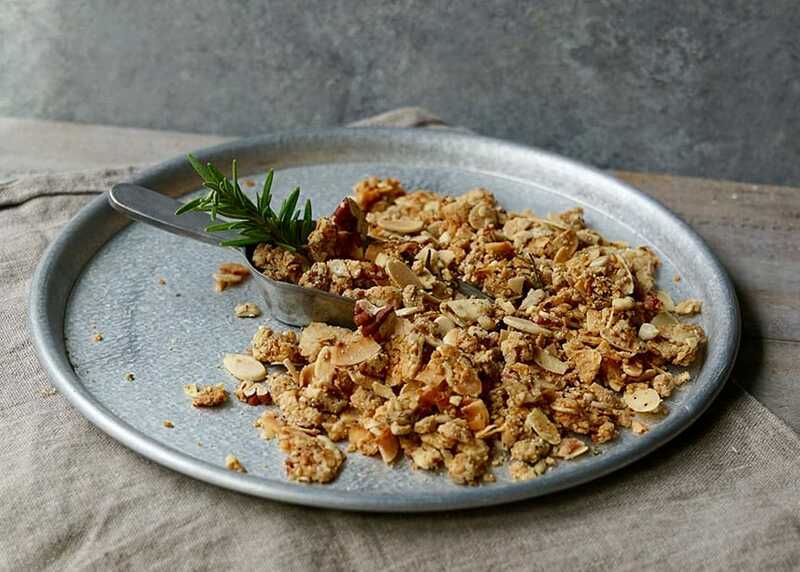 Spread granola out on baking tray. Bake for 20-25 minutes until golden. Move the granola around with a large spatula halfway through baking to brown evenly. Serve with coconut yogurt, hummus, cheese pate, salmon terrine, savory yogurts, sprinkle on salads.